Sponsored Post: This post is brought to you by Yoga Crow, a small business that creates quality yoga clothing for men. Bringing back some Yoga for Men tips today! I can only speak from my own experience, and in teaching and in being in class, I find that women are generally a bit more flexible than men. But don't let the title of this post fool you. Any woman out there who isn't super bendy can apply these pointers as well! So first things first. 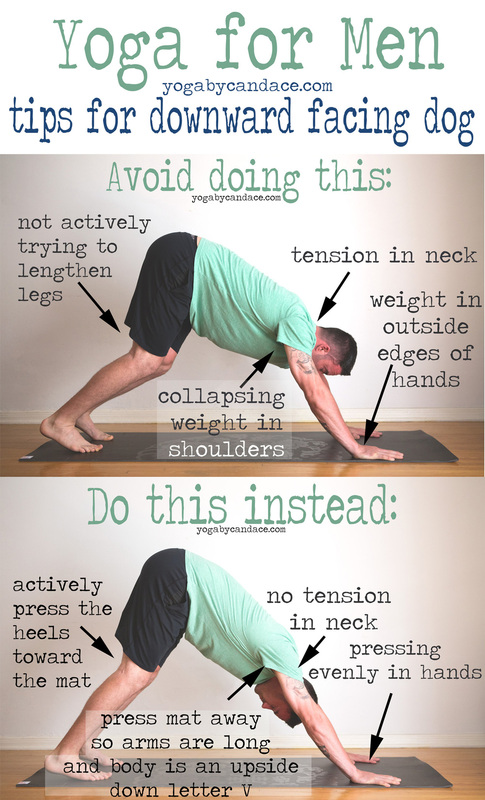 Downward dog is a pose we see quite a bit in a flow or ashtanga class, so I thought I'd bring it back to basics and showcase the mistakes I see most often. My husband Greg is our model today, wearing Yoga Crow's swerve shorts, and there's a review down below of the shorts, if you're interested. So let's get right down to it. One of the biggest issues I see is that men often sink their weight into their shoulders, which lessens the (often uncomfortable) sensation of trying to straighten the legs. Guys! (And gals!) The best way to deal with that sensation in the hamstrings is to stick with it. It's the only way to loosen 'em up. So to do that, press the mat away from you. This will make the armpits really long (big shoulder/chest stretch right there! ), and bring the length back into the legs. Pin it! How to avoid pain in the hands from yoga. An equally big issue is the weight distribution in the hands. Check out the chart above to check yo' self before you wreck yo' self! Once you've got all that figured out, then just let go of the tension in your neck and you're good to go! Ok guys, I know I do a lot of reviews for women's yoga clothing, so this one's for you. The swerve shorts are for the guy who isn't down to wear baggy MC Hammer pants or leggings to class. They're for the guy who wants coverage (there's a mesh shorts lining on the inside), but just wants to be in a regular looking pair of shorts. The fabric is thick, stretchy, and retains its shape. There are two slash pockets on the front, and they can be cinched in at the waist if needed. Below are some photos of Greg in the shorts. He's wearing an XL and he's normally a 34/36 waist, and these fit perfectly. He says the fabric is really high quality, and feel comparable (if not better) than Lululemon's luon fabric (it's what they make the women's yoga pants out of). He's worn them for a few yoga classes, and highly recommends them. you can see how the shorts stretch here. PS- More yoga tips for men, and a yoga video designed for men.